Youth in this ministry serve with respect, reverence and responsibility. Youth in grades 2 through 12 are eligible to serve as acolytes at the Sunday 10:30 worship serves. 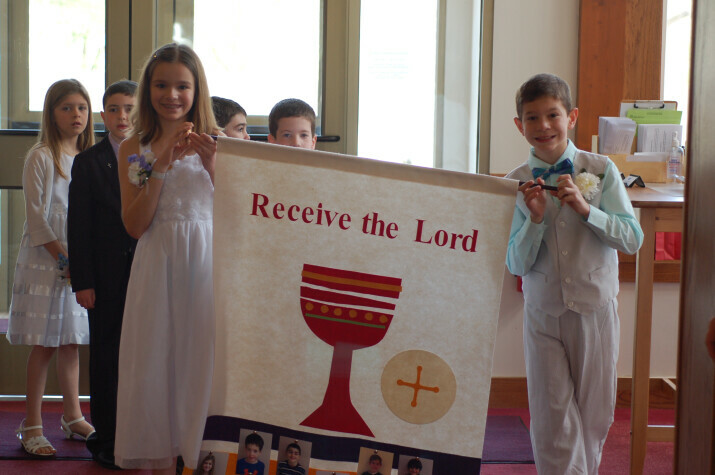 Acolytes who join the ministry are trained to serve as Torch Bearers, Crucifer, Plates, Bell and Server. Some of our Senior Acolytes have taken on the additional responsibility of becoming Lay Eucharistic Ministers. This ministry is definitely a team effort! The youth are serving at the worship services, but the adults are providing transportation and support to teach the responsibility, respect, and reverence needed to make this ministry a blessing to our clergy and the community of St. John's. The Altar Guild of St. John's currently consists of 25 people dedicated to the preparation of the altar for the weekly worship services. The Altar Guild is the liturgical partner of the Priest. The work of the Altar Guild is to ensure that our sanctuary reflects the holiness and the joy that we all create together in our worship. Anyone, men or women, young or old, may have a vocation for Altar Guild service. Training is provided. Contact the parish office at 630-355-0467 to be put in contact with the Altar Guild Director if you wish more information. The healing rite (the laying-on-of-hands) is offered at St. John's on the first Sunday of each month. We believe that healing was central to Christ's ministry during his lifetime and is also central to God's mission in today's world. Our prayer team consists of lay ministers who have been trained in the theology and practice of healing prayer and commissioned by St. John's to serve in this ministry. They meet on the first Thursday of the month for a prayer service and study. If you wish to join this ministry, please contact the parish office at 630-355-0467 to be put in touch with the prayer team. For prayer, please come forward after worship services on the first Sunday of the month or call the office for special prayer. The Lay Eucharistic Ministers (LEMs) and Lay Eucharistic Visitors (LEVs) serve our congregation on the altar here at St. John's and share our Eucharistic traditions at two retirement communities. The services provided by our LEMs and LEVs embody St. John's greater mission to deliver the spirit of our faith community to the broader community around our parish. If you are interested in serving in this ministry, please call the parish office at 630-355-0467 to be put in contact with the ministry leader. If you are interested in music ministries, please send an email to or call the Parish Office at 630-355-0467.